2nd annual Ridge to River Contest winner revealed! Plus, explore whitewater paddling culture in Virginia with Thorpe Moeckel, fishing (for the first time) in Laos with Charlotte Helston, a pilgrimage to Thoreau’s Walden with Christopher Martin, and take a teak-hulled riverboat down the Nam Ou with Laurie Weed. Also, tag along with Rick Mick as he takes on Perkins’ Tremendous Twelve and an ultra-marathon in the Bighorn Mountains, Cheryl Merrill shows us what Game Ranger Training is like in Africa, Klaus Kranebitter wows again with his photography from a climbing trip in Switzerland, and Jon Miceler reveals what it was like to trek through the Himalayan jungle with the world’s greatest wildlife biologist, Dr. George B. Schaller. 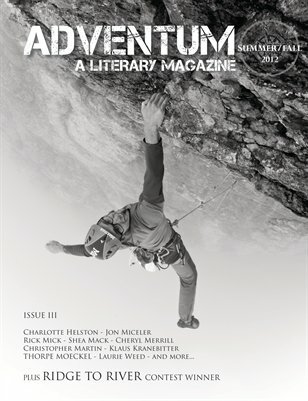 This issue is not only packed with the best outdoor writing, but also groundbreaking photography and haiku.